Max has had music therapy sessions for years now, thanks to the wonderful Joanne. It's been amazing for his development, and he always has a blast. (Sabrina, too.) Music may have powers to soothe the savage beast, but it has special powers for kids with special needs. 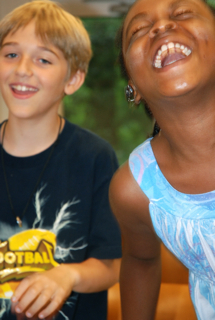 "Singing can open new pathways for language, communication and social interaction," says Yasmine White, founder and Executive Director of Voices Together, introduced to me by my friends at CVS Caremark All Kids Can. She knows what she's talking about: Her award-winning nonprofit, based in Chapel Hill, North Carolina, uses a choral structure and interactive songs to help people with disabilities ranging from 7 to 65 years old. 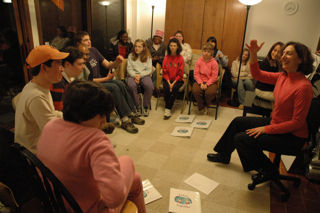 The groups are lead by board-certified music therapists or a music educator, and offered in special ed classrooms and in colleges. "Individuals who have difficulty speaking may be able to sing words, sentences or sometimes sing an entire song," notes Yasmine, who has spent more than 25 years in the field of music therapy. "Music stimulates the brain in unique ways. Rhythm structures the body and mind, and so it is a natural structure for language and movement." • Make up lyrics to tunes you know, like This Little Light of Min. Then stop singing mid-lyric so your child will be prompted to fill in the blank. So for example you could sing, "This little Max of mine, I'm gonna let him shine... this little [stop singing and wait for child to say his/her name] of mine, I'm gonna let him [stop singing and wait for child to say his/her name.]" This expectation of a response is very motivating. • Get kids moving their bodies to the rhythm. You can, for instance, suggest that your child move their arms up or down to a song. 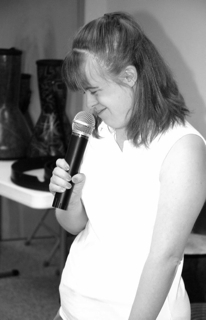 At Voices Together, we've made up songs like "I feel the beat in my feet!" and children stomp their feet. • Use rhythm to increase language and social skills. Purchase some toy instruments or get out the pots and pans and flip them over on the kitchen floor so you have different sound drums, then give your child a wooden spoon to smack them with. This is a great opportunity to work on turn-taking, listening and initiating an action (and fine-motor skills, too). For example, say "Your turn" and encourage your child to bang on the instruments, then at a certain point give them a verbal cue—"annnnnnnd stop!" Then say "My turn" and you play a rhythm. • Use rhythm to work on imitation by banging out a rhythm or even making up a word or words to a rhythm, then wait for your child to imitate you. Ellen, you know I'm a former music teacher right? I love this. I did not know that! But I am not surprised to find out that music is amongst your many talents. The very first kid with special needs that I ever knew was in a kiddie music group when we were 5. She had CP as well, I think, and the rest of the kids were all very interested in getting to know her better/helping her out when she needed it/incorporating her into the larger group. Definitely a great way to encourage friendships! I wonder if there are any music groups or choirs or something in your area that might accomodate people with disabilities? I am autistic and I play the flute. It reduced my sensitivity to high pitches.